Text by Daniel Miller, Reuters "An African-American political advocacy group is targeting "Celebrity Apprentice" star Donald Trump in the aftermath of what many feel are racially tinged political comments made about President Obama. I am so sick of these racist so-called civil rights groups "bullying" people with "race." It is an indisputable fact that the liberal mainstream media exempted presidential candidate Barack Hussein Obama from the usual vetting process of one seeking to be elected Leader of the Free World. Obama's skin color trumped everything. Thus, for the first time in U.S. history, we have a president who can not be criticized in any way. "Hear ye, hear ye, all who dare criticize King Obama is automatically guilty of racism and will suffer the consequences!" This is totally absurd and insane. Obama has been in the Oval Office for two years. 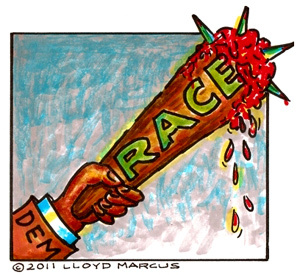 Black "race pimps" continue to despicably, without reservation, drive a wedge into the heart of national race relations. Whenever these black race pimps, including the Obama administration, find themselves on the losing end of an argument, they turn it into a racial issue branding the opposition racist. President Obama would not have responded to Trump's request for him to present his birth certificate unless he felt he had to do it. Obviously, polling data must have confirmed that millions of Americans felt Trump's request was reasonable. In response to the uppity white boy, who dared question their king, a few black celebrities and black bullies disguised as "civil rights" groups are calling Donald Trump a racist targeting him for destruction. So, are all of the other Americans curious about why Obama was not presenting his birth certificate racist as well? Will somebody please tell these black racist bullies to "stop it and get a life"? We do not tolerate "white" skinheads. Nor, should we tolerate "black" racists. Incredibly, black race pimps feel their racism is OK. It is as if they view America's original sin of slavery as their, "Right to be Racist For Free" card. Using race to bully people into submitting to an agenda is racist; pure and simple. Liberals do this all the time. They have a basic emotion driven dislike for America and all of the traditions and values which have made is great. They hide their disdain for America under a shroud of intellectual mumbo-jumbo; spouting crazy stupid nonsense which sounds above our ability to understand. I call it, "Intellectual Stupid Speak." And, something else that truly annoys me. The black community is not a tribe with chiefs dictating our monolithic opinion. I ask that these disgusting race baiting organizations please stop running around proclaiming they speak for "the black community." I am black. They do not speak for me.